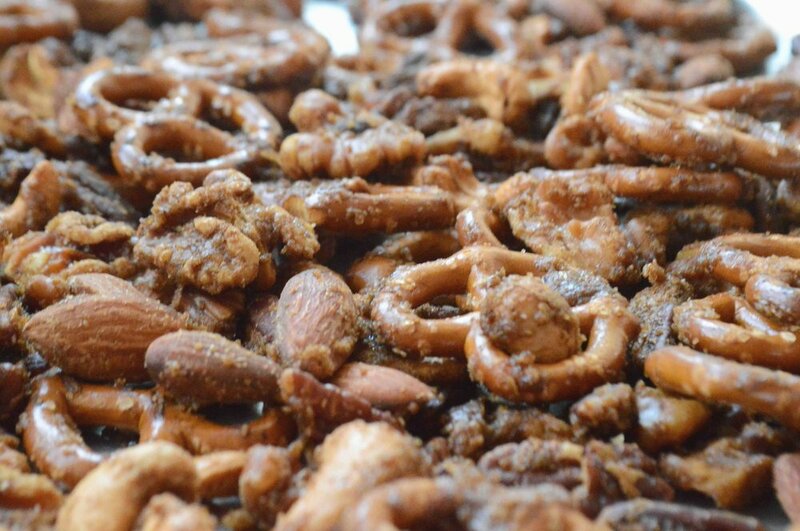 Another winner in the Super Bowl hit parade—this easy and addictive Sweet ‘n Spicy Pretzel and Nut Mix. As far as I’m concerned, football games were made for crunching on big bowls of this stuff! Are you a pretzel person? I live with one. Seriously, the sight of a big bag of mini-twists or sticks brings him so much joy (add in some mustard and cheese and he’s in heaven—but maybe that’s TMI) so you can only imagine how much he loved this pretzel filled nut mix! Even if you’re not a pretzel fanatic (read me) you will love this addictive mix of nuts, cinnamon, sweetness and spiciness. Oh, and pretzels too. Can’t forget about those little guys now, can we? You’ll also love how easily this comes together. It’s just a little bit of stirring and a little bit of roasting. Easy-peasy and perfect for parties! Which brings me full circle back to the Super Bowl—our guiding force for the week. So here’s the plan: Make this mix, place it in some sort of bowl, turn on the TV, make sure said bowl is within arms length and…need I spell it out? Enjoy!! 1. Preheat oven to 350ºF. Spread nuts on a rimmed baking sheet and roast for 10 minutes, stirring once at the halfway mark. 2. Mix together the butter, sugar, cinnamon, cayenne and maple syrup in a large bowl and add the warm nuts, stirring to coat the nuts well. Then add in the salt and pretzels and stir until everything is well coated. 3. 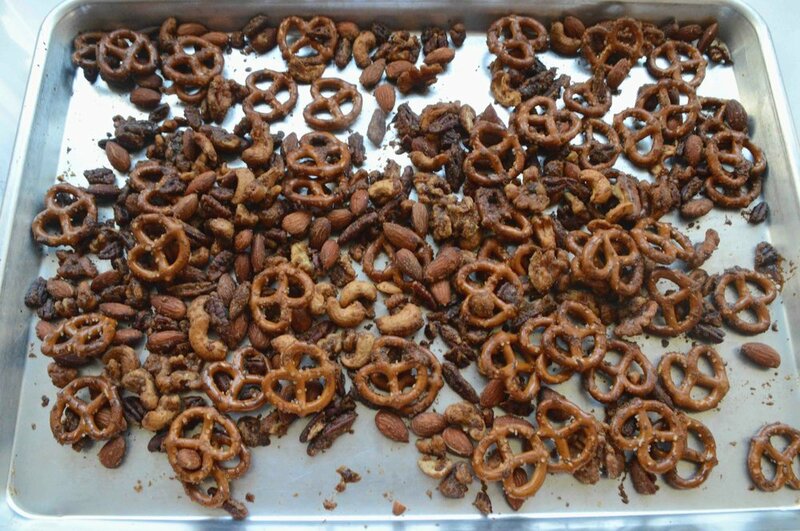 On the same baking sheet that you roasted the nuts, spread the pretzel mixture out evenly and return the pan to the oven for 15-18 minutes, stirring a couple of times during the baking process. Remove the pan and let cool completely, then break apart any large clumps. Serve immediately or store in an airtight container at room temperature for up to one week. Note: Recipe adapted from The Sweet Life in Paris by David Lebovitz. I tinkered with the spices—you can totally make this your own.